It is a principle in Anglo-Saxon law that wilfull destruction of evidence is prima facie indication of guilt. In Brief History, we saw the Time, May 3, 1993 photograph of the destruction of evidence at the Mt. Carmel Center. Informed persons know that destroying evidence is a crime. Therefore the US needed to find a mechanism whereby it could destroy evidence in the Mt. Carmel Center and plausibly deny it had done so. The US also had to fabricate a story to cover the deaths of the Davidians whom it had already killed, or intended to kill. The plan to insert C/S gas to drive the Davidians out was a good cover story. It provided such plausible denial. Tanks could charge up to the building under the ruse that gas was being inserted; the deaths, the destruction of the building, and the fire could be explained as having arisen from unintended consequences of that action. Alternately, the Branch Davidians could be blamed for the deaths and the fire. But even after the event the perpetrators needed a cover for further alteration of the crime scene. The Texas Rangers provided that cover. After all, the Texas Rangers had been accomplices from the beginning, when they surrounded Mt. Carmel before the raid (Treasury Report, pg. 79). On April 20 the FBI pretended to turn over the crime scene to the Texas Rangers, and the Texas Rangers pretended to accept the responsibility (The Washington Post, April 21, 1993). Let us visit the principle of plausible denial once again: "The principle of plausible denial is simply if an operation or action is later disclosed, for example, as an action by the United States government, the government can plausibly deny it, deny any involvement or connection with the action. "— E. Howard Hunt, ex-CIA operative, quoted by Mark Lane in Plausible Denial. The Texas Rangers had been asked to take over the investigation of the crime scene by the US Attorney's office and the ATF (Transcript, pg. 646). The Texas Rangers had complied with the request to give the crime scene investigation an appearance of independence (Transcript, pg. 629). All Rangers taking part in the crime-scene investigation had been deputized as US marshals, reporting to the US Attorney's office in Waco (Transcript, pg. 602). The Rangers had previously been put in charge of the criminal investigation of the Branch Davidians after the death of the four ATF agents. When they objected to the destruction of the crime scene throughout the siege, the FBI ignored their complaints (Transcript pg. 631). The Rangers continued on in their role anyway. They delivered the evidence they collected to the FBI (Transcript pg. 617). The remaining debris (possible evidence) was hauled away by the FBI and buried in a location unknown to the Texas Rangers. This occurred before defense attorneys were permitted to visit the ruins, as stated by defense attorney Jeff Kearney (Transcript pgs. 1081 and 1082). A section of the front door of the Mt. Carmel Center (bearing vital bullet hole evidence of "who shot first?") disappeared while the Texas Rangers were in control of the crime scene (Transcript pgs. 1090 and Transcript pgs. 1091). The Texas Rangers allowed the federal government to select the arson investigation team (Transcript pg. 668). The Texas Rangers hoisted the ATF flag up on the flagpole outside the concrete room at ATF request (Transcript pg. 643). Military doctors from Ft. Hood were going to attend survivors of the gas attack (Transcript pg. 609). The Texas Rangers were assigned to arrest all survivors over 18 years old and put them in jail (Transcript pg. 608). That is, the Rangers were to serve as processors of the paperwork. During the trial, a defense attorney revealed that two hundred fifty (250) law enforcement officers searched the grounds each day, with only 33 Texas Rangers to supervise (Transcript, pg. 1090). 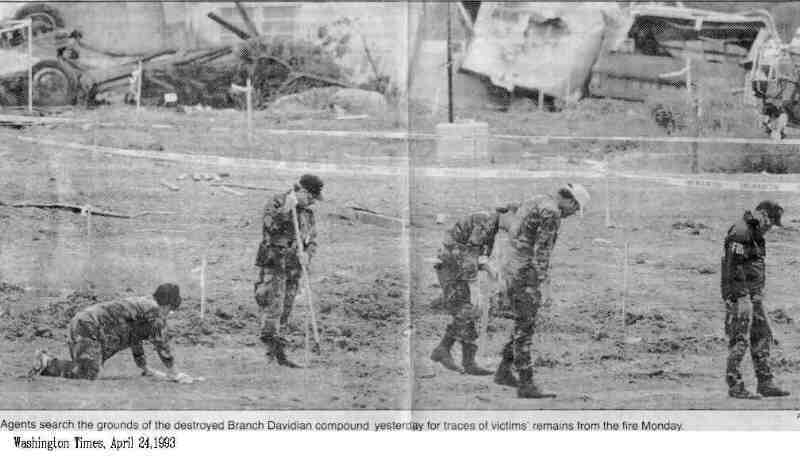 A newspaper photo (The Washington Times, April 24, 1993) shows FBI agents searching the grounds for Davidian remains on April 23. No Texas Ranger supervisor is apparent in the photo or mentioned in the caption. Two hundred fifty "law officers" —many of whom were FBI agents — stomping over the crime scene each day could arguably destroy a crime scene more efficiently than a herd of elephants. Not only were the Rangers deputized to the federal government and put in charge of the crime scene that they were not able to control, but the Rangers' work force was stuffed with FBI and other officers to gather the evidence. Now who was truly in charge? Then, on April 31, "authorities bulldozed the concrete bunker that was the compound's last standing remnant." (The Dallas Morning News, May 1, 1993). This action destroyed the site in which the bodies were found—within two weeks of the alleged date of the deaths. So much for the Texas Ranger's control of the integrity of the crime scene. The Texas Rangers simply allowed their name to be used in the pretense that a "law enforcement" process was in progress. In early 1995, two years after the event, when Waco Remembrance coordinator Carol A. Valentine called the Texas Rangers and asked for diagrams showing where the remains were found in the Mt. Carmel Center, both the Waco and San Antonio offices of the Texas Rangers referred her to the ATF in Washington, D.C. Had the Texas Rangers truly been in control of the crime scene, they would not have referred Valentine to a federal agency. Tucson, Arizona attorney and Waco researcher David T. Hardy filed a Freedom of Information action on the ATF, requesting documents, photographs, and videotapes taken on February 28, 1993. In response, the ATF said they had few if any of the documents requested, and none of the videotapes. They said they had given the material, without making copies, to the Texas Rangers (a state agency investigating the local murder of ATF agents). When Hardy asked the Rangers for the material, the Rangers wrote to Hardy that they had not been acting as state officials, but as US Marshalls at the time. Accordingly, they had given all records to the US Department of Justice. "Just a shell game with the evidence—it seemingly vanishes into State hands—but when traced, it turns out to have been in federal hands all along," wrote Hardy. And the Rangers were, temporarily, federal agents. We will see how the orchestrated incompetence of the Two Stooges, the Texas Rangers and the Tarrant County Medical Examiners Office, worked to accomplish the US government's plausible denial in the destruction of the crime scene and the destruction of evidence contained in the corpses of the Branch Davidians.